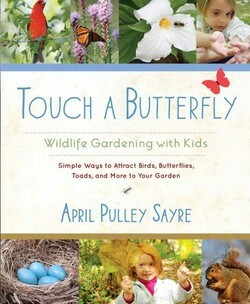 Touch a Butterfly, by April Pulley Sayre, is a delightful read. Its goal is to get families—kids included—outside and in touch with the natural world through gardening. But it is so much more than a guide. It’s a learning process, and the author shares her years of learning to give you a head start. Her pretense may be to teach you how to share the joys of nature with your children. But you, too, will be bitten by the bug! Like any good garden—indeed, like nature itself—this book has many tangents. But they never lead the reader far astray, because each section is short and to the point. For example, a section about hummingbird flowers zips off to a description of bat flowers—and how a bat can be as great an addition to a garden as a hummingbird—and then zips right back to hummers. Just when you think you’re getting a step-by-step how-to about a particular aspect of your garden, you’re presented with an activity idea. Each one sounds so fun and easy, you want to drop the book and go right outside and try it—or at least mark the place so you can go back to it when the kids are home and the time is right. In the most unassuming and non-invasive way, the author freely credits other authors and resources and also references many wonderful, previously published books of her own. There’s no need to worry about losing track of such recommendations: Those and more can easily be found in a helpful, categorized list at the end of the book. Splendid, colorful photos of backyard friends (animals, plants, and children) accent many of the pages and help bring the idea of a garden to life—even before getting your hands dirty. Seeing sunlight shining on small hands and expectant faces throughout the book constantly reminds you that kids and nature make a perfect pair. The photos also entice you with limitless ideas of what you might anticipate in your own garden. And who wouldn’t be delighted by a story about a “pocket bird”—a tiny wren that built her nest and raised her chicks in a pair of overalls hanging on a clothesline? There may be more traditional ways of welcoming and nurturing wildlife in your backyard, but some—such as this one—are just more memorable. April shares numerous such personal asides in her book. They make you wonder what memories might be made in your own landscape. National Wildlife Federation is hosting a “Gardening as Family Time” webinar on Wednesday, May 29, at 7:30 p.m. Eastern. We’ll have lots of ideas for adding kid-friendly and fun elements to your garden. Register today.